Posted on December 1, 2017 at 10:08 pm. We finally did it! We (that is to say I, my husband and our now 7-month-old baby boy) always took a little peek inside East End Taverna every time we had a parcel to pick up from neighboring 2Go. 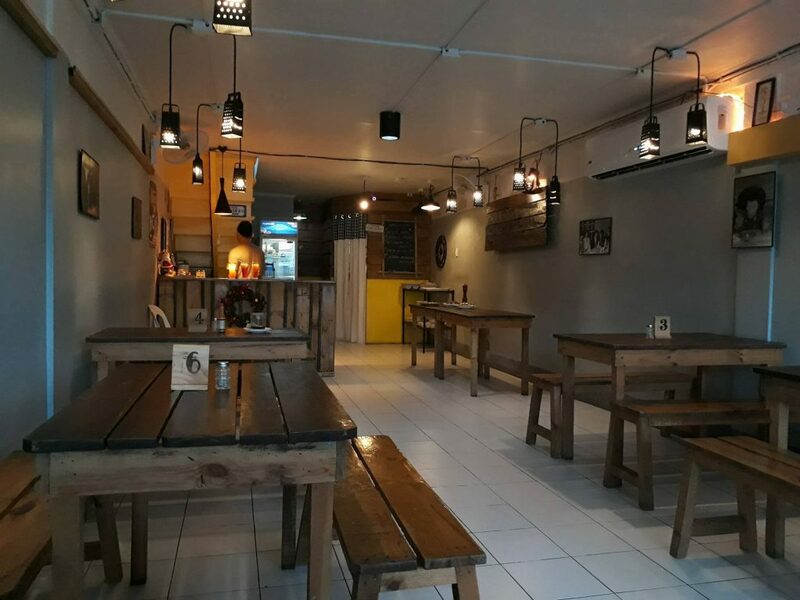 The place – with its warm tones and wooden accents – always looked so inviting, especially amidst the whole utilitarian vibe of the building in which it is located (think motorcycle accessories store, freight/cargo forwarders, therapy clinic – you get the drift). But every time we looked in, we always turned away – unsure of what we would find inside. Well, yesterday, we did more than just look. I put our baby boy to sleep in his carrier (proud babywearing momma here) then we went in and tried their food. And now we’re thinking we should have checked out East End Taverna a lot sooner. Who knew these French doors hid something truly wonderful inside? 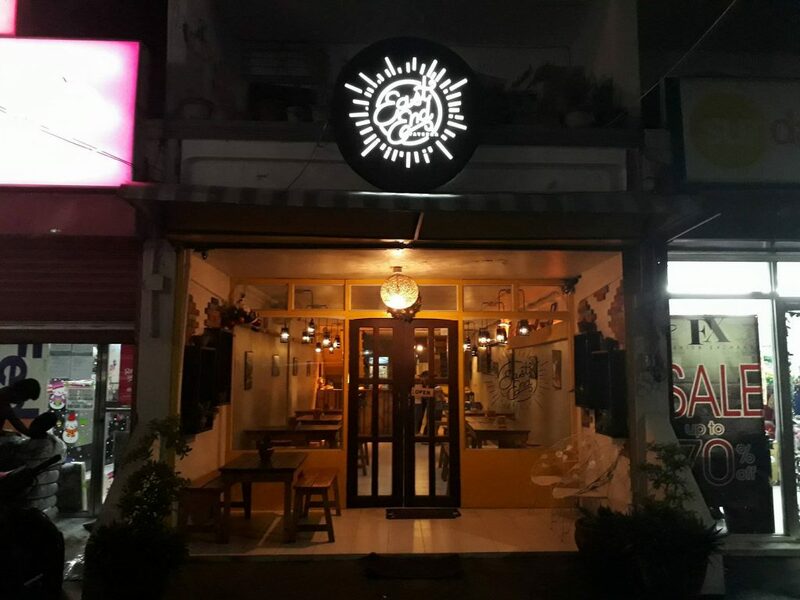 And the place looks as charming from the inside as it does from outside. But you’re not here for an artsy-fartsy description of the place. So without further ado, let’s move on to the Lowdown. So that’s Italian for Beef Medallion. I know; it sounds so much lovelier in Italian. But more important than the name is the taste – and, in this, the Medaglione di Manzo does not disappoint. It is as delectable as it is lyrical. This is a simple steak, but boy does it taste awesome! I guess it’s the technique that makes the difference. The beef medallion is butterflied then pounded with a meat mallet (to tenderize the meat) then pan-seared with butter, rosemary and garlic. Sounds rather simple, I know, but it is exquisite. The steak is perfectly cooked (medium rare), so the meat is juicy and tender (and pink inside). It is also perfectly seasoned; this made me appreciate even more the texture and the flavor of the meat. By the way, Medaglione di Manzo comes with a mushroom gravy, but you won’t really need it. The steak, on its own, tastes wonderful. 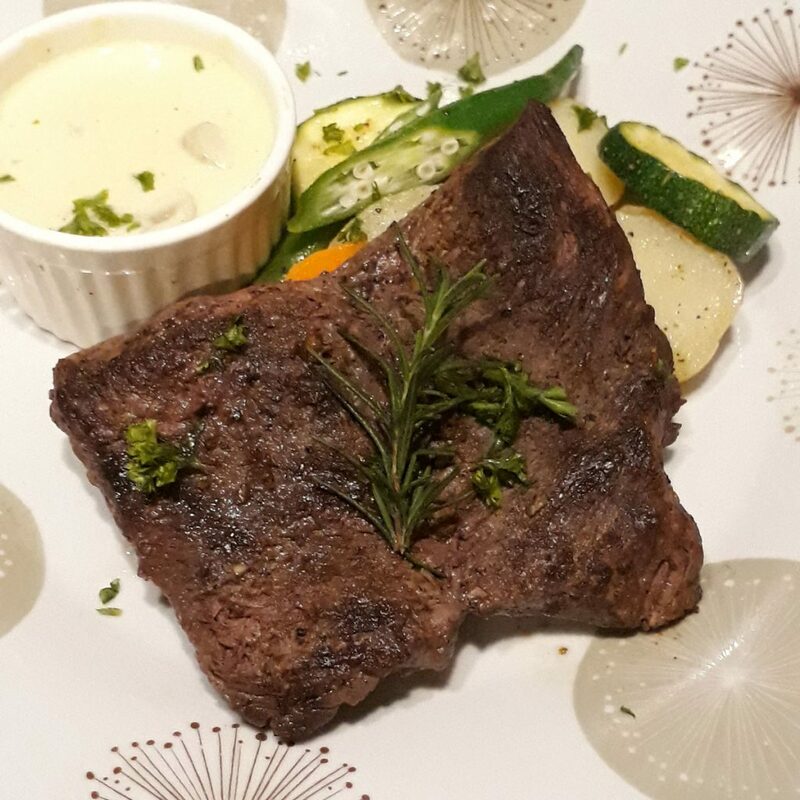 But the gravy does give the steak a different flavor, turning the steak into a whole new dish. I’m definitely coming back for more of this steak. As the name suggests, this is chicken wings with a bit of crab fat (aligue). But the name does not prepare one for the explosion of unique (definitely delightful) flavors and textures that a single bite of this dish can deliver. 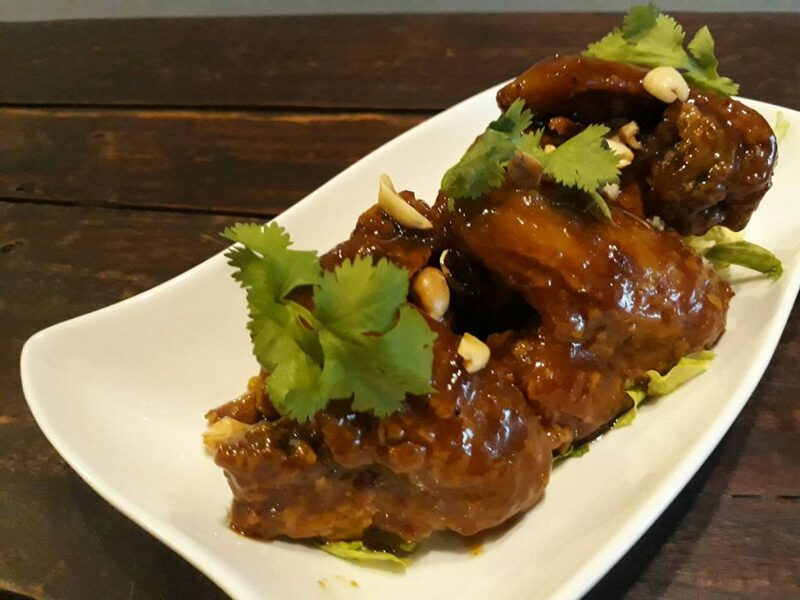 It is sticky, sweet and spicy – but it does not taste like your typical sticky, sweet and spicy chicken wings. The spice comes from the ginger (used in the white wine marinade). The sticky part comes from the glazing, and the sweet comes from the Muscovado sugar (used in the glazing). But all these things are made better with the addition of the taba ng talangka, the aligue or the crab fat. There’s just a bit of it in the glazing, I was told, but it gives the chicken wings a refreshing (definitely not overpowering), salty seafood zing. It’s the combination of tastes and flavors rather than the individual ingredients that makes this chicken wings dish special. 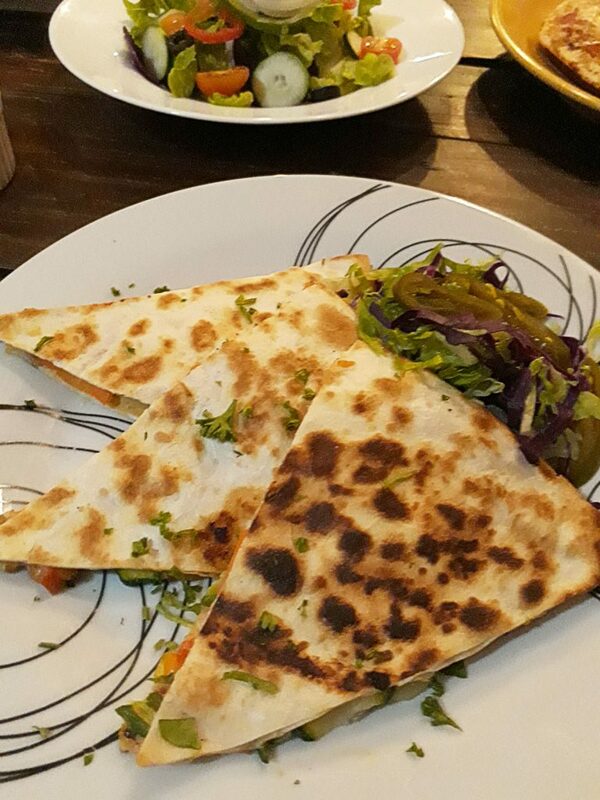 This is Vegetable Quesadilla – as you can probably tell by the name – but it tastes nothing like you would expect a vegetable quesadilla to taste like. When I bit into a quesadilla, I was expecting cheesy taste with bits of vegetables thrown in and I’d be pretty satisfied with that. What I got, instead, was deep, rich flavor. I was told there was no special ingredient. Again, it was technique that made this quesadilla so strikingly delicious. The vegetables (including zucchini, carrot, and herbs like coriander) are mixed with cheddar then used as the quesadilla filling. This filling is smooth, and its flavor is superb. Yum! I’ve never been as enamored with a vegetable quesadilla as I am with East End Taverna’s La Verdura Quesadilla. The Mediterranean Salad is a lovely combination of salad greens. There’s Romaine Lettuce and Radicchio, cucumber, black olives, bell pepper, white onions, and tomatoes. Even with the use of the watery veggies (namely cucumber and tomatoes), the salad remains dry and crisp (again, it’s technique that makes the plate go round – doesn’t make sense at all but sounds good anyway). 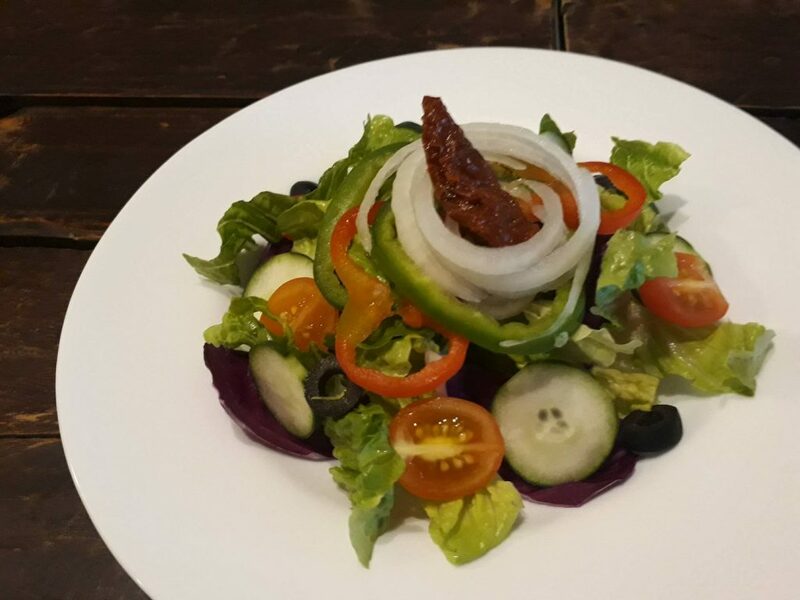 The ingredients are very fresh and the salad very light. I highly recommend it, especially with the dressing of vinaigrette and (as much as you want) balsamic vinegar. I find that the vinaigrette tastes lovely on its own, but the balsamic vinegar brings everything alive. It’s true; a little acidity goes a looong way. 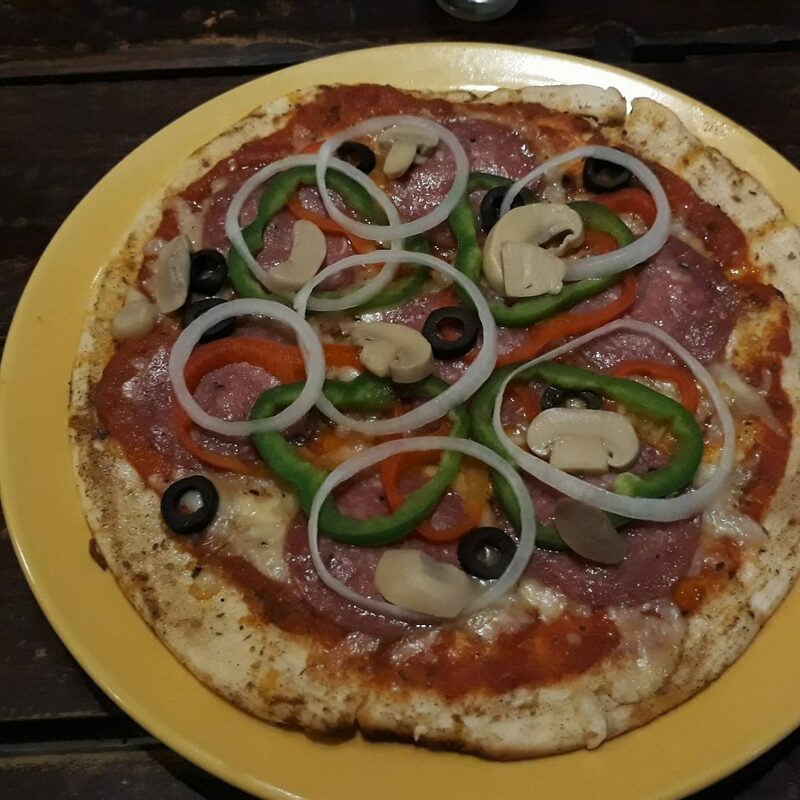 This is a very simple pizza. 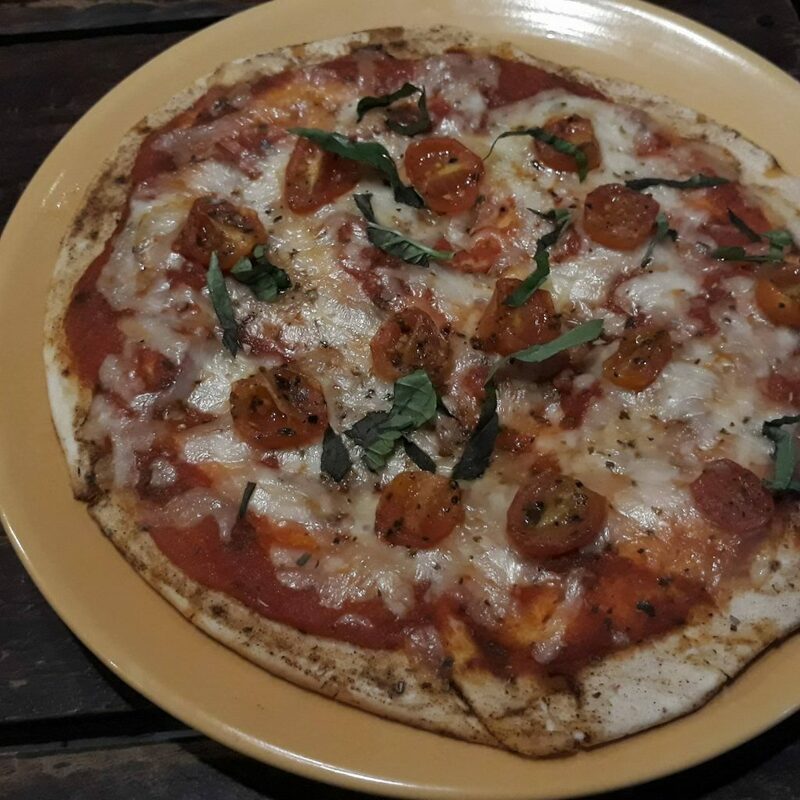 Thus, what makes a good Margherita pizza for me is one where there’s a good balance of ingredients but the ingredients still shine individually. And that’s what one gets with East End Taverna’s Pizza Margherita with its toppings of basil, cheese, and confit of cherry tomatoes (the tomatoes taste really fresh, by the way). 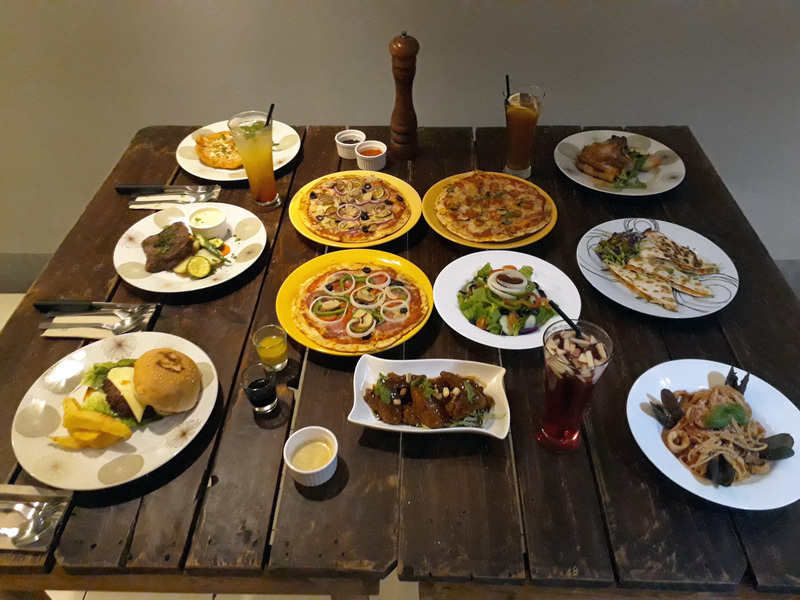 Insider’s Tip: If you want an out-of-this-world pizza and salad experience, order both the Margherita Pizza and the Mediterranean Salad. Now place your salad on top of the pizza. Drizzle with as much or as little of the dressing as you prefer, then roll. I tried a slice of Margherita Pizza topped with Mediterranean salad; the chef wasn’t kidding. It’s really good! And just because I am a fan of the Margherita Pizza (especially topped with the Mediterranean Salad), that doesn’t mean I have no room for other pizzas – especially this Pizza Ortolana. Just look at that. And yes, it tastes as heavenly as it looks. The ingredients are just so fresh! Like most people (I assume), I like pork dishes. I’m a bit leery, however, when presented with a thick cut of pork. It can look juicy, but with such a thick cut of meat, I can’t be really sure until I cut it open. I’m so glad East End Taverna’s pork chop does not disappoint. 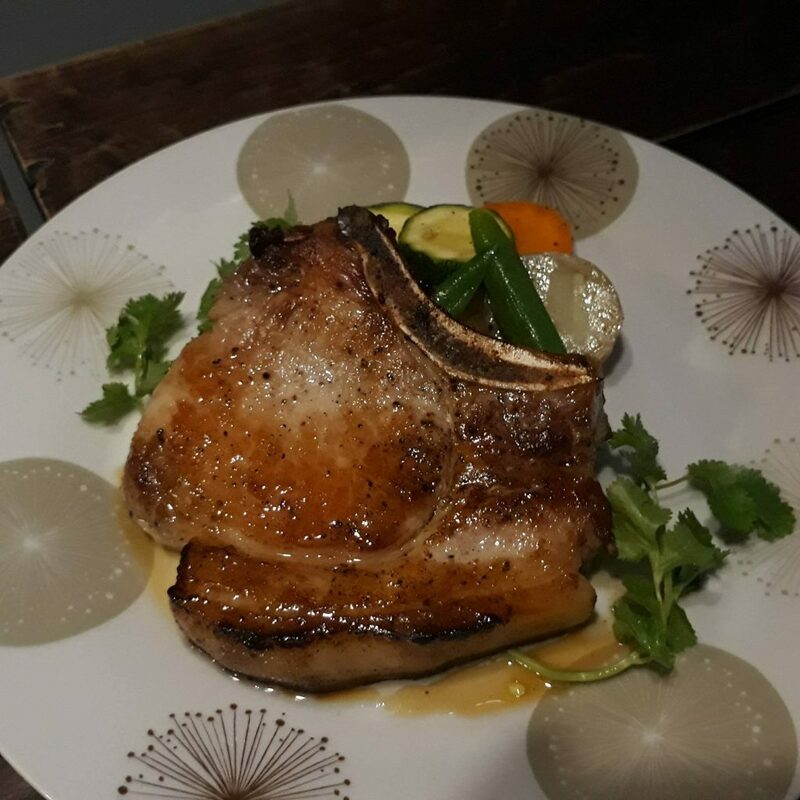 The Double Cut Pork Chop is cooked perfectly. It’s well-cooked without being overdone so it’s still juicy and tender. But more than the texture, the flavor really blows me away. Dipped in the accompanying sweet pommery mustard sauce, the pork chop is sweet and tangy and oh so yummy! The sauce hits that precise balance of sweetness and acidity. 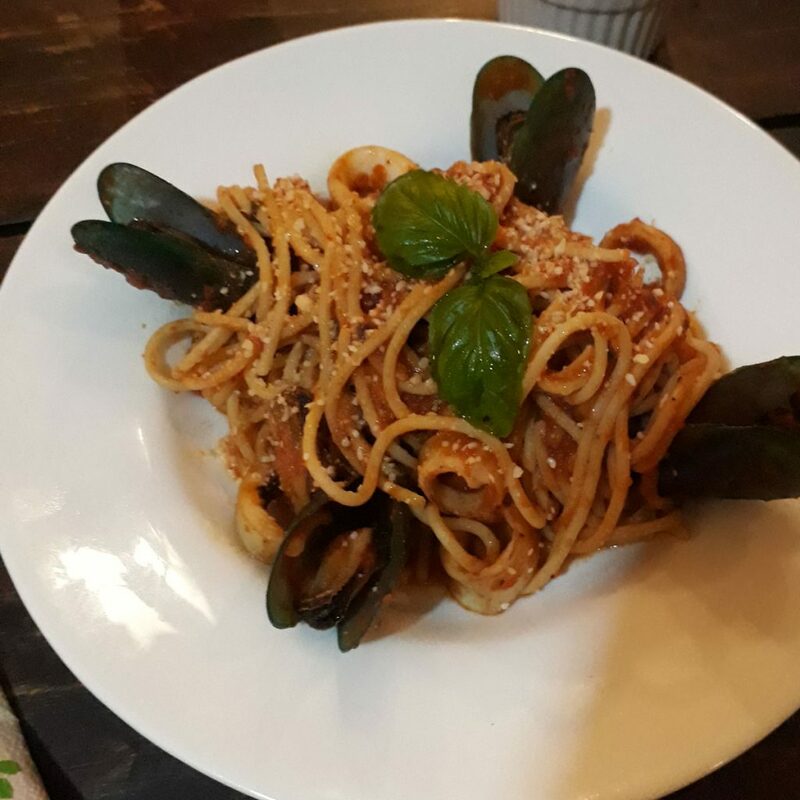 And, of course, my East End Taverna sojourn wouldn’t be complete without pasta so I had the Pescatore Pasta (translates literally to Fisherman Pasta but is essentially a Seafood Tomato Pasta). This pasta dish is wonderfully composed. There is just enough sauce coating the pasta so one gets a perfect bite of pasta each time. Like the other tomato-based dishes, the Pescatore also tastes of fresh tomatoes. Simply delightful! If you like Iced Tea, the House Tea is recommended. It doesn’t taste like anything you can make yourself. Those who love fizzy drinks (wine spritzer, anyone?) will enjoy the East End Champagne – a citrus and white wine infusion. For a nursing mom like me who cannot have tea or anything remotely alcoholic, the Pineapple Juice is highly recommended. It tastes and – thanks to the Grenadine – looks divine. Yes. It’s pretty obvious that I loved everything I had at East End Taverna. Just to make sure, I asked the chef, “Does everything taste as good as this all the time?” He said yes; it’s their standard. How I love that response! We will definitely be back (and really, really soon, too).